Today we take a look at one of Nintendo’s key figures and what inspired Nintendo’s flagship characters. 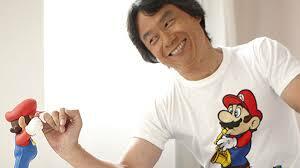 It should come as no surprise that we are talking about Shigeru Miyamoto. Unlike Hideo Kojima and Keiji Inafune, Miyamoto has never been a polarizing character. He has never criticized the game industry or Japanese corporate culture. Miyamoto has always been incredibly positive and fearless when it comes to big shifts within the industry and his home company, Nintendo. Indeed the creative minds at Nintendo all seem to have one thing in common, they enjoy playing! They enjoy having fun and they always seem to know how to do it. Only the likes of Miyamoto and his ilk would be able to smile their way through such palm-to-face moments in Nintendo’s history like the Wii Music unveiling. Let’s take a look at four games and their sources of inspiration. When discussing his inspiration for Zelda, Miyamoto refers to the Kyoto countryside. As a young boy he would spend time exploring forests and caves and remembers fondly the anxiety of getting lost in unfamiliar areas. That same sense of discovery could be felt in the sweeping landscape of the original NES Zelda tale. Zelda’s non-linear gameplay and lack of direction left the player to their own devices in order to figure out what they needed to do. There is no better embodiment of the joys of being a child then Mario. As kids jump over sidewalk cracks and puddles, Mario jumps over caverns and obstacles. While kids jump on bugs with a satisfying squish, Mario does the same with Goombas. Mario’s care free run and jump mechanics in the paradigm shifting Mario 64 are explicitly modeled after how a child would run through a field. Miyamoto shared that the Chain Chomps are inspired by a somewhat traumatic experience he had while exploring the allies of Kyoto. As he rounded a corner a chained dog lunged and startled him. That same sense of surprise and anxiety could be felt during the first Chain Chomp encounter in Mario 3. While common lore would credit Miyamoto’s love of gardening as the inspiration for Pikmin, further interviews would prove that to be untrue. The development process for Pikmin was much less focused and uniquely “sand-boxy”. Later Pikmin short films would be inspired by one key question that continued to nag at Miyamoto, “What would the world look like to Pikmin if they were here?” It is this sense of imagination, and willingness to experiment and to play that helped push along Pikmin’s creation. The willingness to explore ideas, to fail, and to try again is a foundation of play and a key to having success. It is most children’s dreams to have a pet dog or cat. Nintendogs and Cats was Miyamoto’s way to give children, or adults, the experience and joy of having a pet without the mess. In the same vein as Gigapets and Tomagotchi, Nintendogs and Cats allowed players to use the touch screen to care for and play with their animal. The exact inspiration for the program seems to be a pet training class Miyamoto took part in after acquiring a new puppy. He took great joy in training his dog and wanted to capture that experience for gamers proving that inspiration is all around us! Miyamoto himself knows how to play many different stringed instruments and it is a hobby he very much enjoys. This game received a lot of negative press but it also has its own share of victories, inspiring some to get into creating music. Anything that can introduce the joy of music composition deserves due credit. It’s amazing what something as simple as play can do to enrich our lives. For some it is a way to release the stress of the day, while for others it is a source of inspiration. As we will see in future writing, research is building on the importance of play in children’s lives and the positive effect that both physical play and video games have on a child’s brain. How do you play? What is your inspiration?